Click here to download an easy-print PDF copy of the printed user manual. The twenty third century Phaser co-designed by Jefferies and Roddenberry was standard issue aboard Starfleet vessels. Although primarily intended as defensive weapons, their power, design and flexibility made them useful for heating rocks, cutting through armour plating and even as a backup energy source capable of powering a small shuttle craft into orbit in an emergency. This Original Series Phaser Universal Remote Control is not a toy: it is an advanced, gesture based universal remote control, designed to control home entertainment equipment such as TVs, DVD players, Blu-ray players and iPod docks, using infrared codes learned from conventional remote controls by the means of gestures rather than by pressing buttons. A total of nine different gestures and four separate memory banks enable the Phaser to learn up to 36 remote control functions. At the press of the trigger button, the Phaser pulses and produces one of nine different Phaser firing sounds (depending on the setting of the Phaser II dial), and has the power to instantly stun almost any TV without any setup required. This Phaser is also a highly accurate prop replica designed using 3D laser scans taken of the last known hero prop used by the cast of Star Trek, The Original Series, in the 1960s. Both Phaser I and II are powered by a rechargeable lithium power cell in the Phaser I. Before first use charge your Phaser I for two hours, or until the mode selector button flashes green. 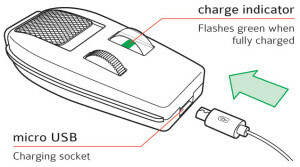 To charge, undock the Phaser I from the Phaser II by pressing the release button on the left hand side of the Phaser II and insert the micro USB cable supplied, and charge from any suitable powered USB socket. Note: the charging cable can be found under the stand in the Phaser’s protective transit case. The Phaser indicates that it needs charging by saying “power cell drained” after a gesture. The Phaser I may be used undocked while it is charging. The Phaser II does not need charging; it takes its power from the Phaser I. Note that the battery should be looked after as lithium polymer batteries can become damaged and fail if not regularly charged. The Phaser should be fully charged at least once every six months to make sure that the battery remains in good condition. The Phaser universal remote control consists of three major components: Phaser I, Phaser II and the grip. When assembled they create a highly accurate facsimile of the original Phaser. The Phaser I houses the Phaser’s three primary microcontrollers, its rechargeable lithium battery and its infrared emitter. As a result, the Phaser I can operate on its own when undocked from the Phaser II. When undocked, its various functions are activated by pressing the Phaser I trigger button located on its underside. When the Phaser I is docked, its various functions are activated by pressing the trigger button above the grip under the main body of the Phaser II. To dock the Phaser I, insert the front of the Phaser I into the Phaser II front docking recess, at a slight angle, and then push the back of the Phaser I into place until the locking catch clicks. To undock the Phaser I, press the release button on the left hand side at the back of the Phaser II to release the locking catch. Lift the back of the Phaser I and gently pull it backwards out and away from the Phaser II dock. Personnel must take care not to damage the connector pin array when undocking and docking the Phaser I. The contacts on the bottom of the Phaser I should never be shorted together. To attach the grip, push the asymmetrical locator pins into their matching slots in the base of the Phaser II. To secure the grip, gently tighten the grip-securing bolt with the special Enterprise screwdriver supplied. Press and hold the mode selector button (a long press) to power up or power down the Phaser. Practice Mode, short press -> Control Mode, short press -> FX Mode, short press -> back to Practice Mode again, etc. Only correctly trained personnel are permitted to use the Phaser, so before entering any other operational mode, all personnel must learn how to do the movement gestures correctly. To enter Practice Mode, press the mode selector button until the P is lit red. In Practice Mode, each time a gesture is performed while the trigger button is pressed and held, the Phaser will say which gesture it thinks has been attempted. If the Phaser misinterprets a gesture, hold it steady for a few seconds then repeat the gesture taking care to use short, accurate, positive movements. Once the gestures have been mastered, the user is cleared to move on to Control Mode, where the use of live infrared (IR) beams will enable the control of domestic equipment with the Phaser. To enter Control Mode, press the mode selector button until the C is lit and then double-click press the mode selector button to select the required memory bank. Each double-click press will cycle to the next memory bank and the C will glow either red, green, blue or yellow depending which memory bank is selected. Each memory bank stores up to nine codes. Therefore the Phaser can store up to 36 codes in total. To fire a remote control code, press and hold the trigger button and do one of the eight movement gestures. 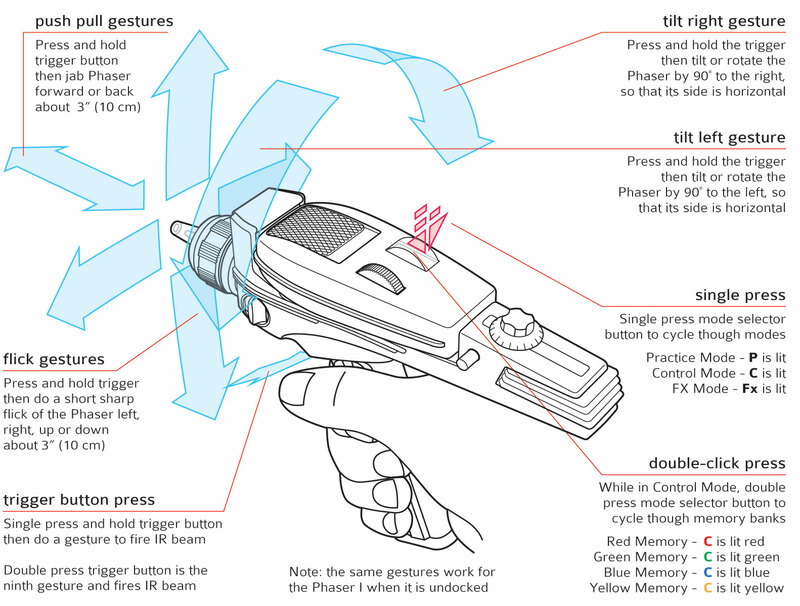 Each time a gesture is performed correctly (while the trigger button is pressed), the Phaser will fire the infrared (IR) remote control code that is programmed onto that gesture. The ninth gesture is a double trigger button press; hold the second press to fire constant IR. Where no IR code has been programmed onto the gesture, the Phaser will not fire but will say “unassigned”. Phaser II dial settings from one to nine will select different Phaser firing sounds. If the Phaser II dial is set to zero, then each time the trigger button is pressed and a gesture is performed correctly, the Phaser will emit the IR code programmed onto that gesture, make a quiet click and the emitter will flash, but no firing sound will be heard. If no IR code has been programmed onto the gesture, the Phaser emitter will flash but it will remain silent. When the Phaser I is undocked, it remembers the last Phaser II dial setting. The Phaser I must be docked in order to change the firing sound setting. To stun almost any TV into the off state without the need to program the Phaser, while in Control Mode, point the Phaser at a TV then press the trigger button three times and hold the third press. As long as you keep holding the button, the Phaser will fire bursts of IR as it scans through a sequence of TV on-off remote codes, emitting each one to find the code that will stun the TV. Each time it sends an IR code the emitter will flash. Release the trigger button when the TV is turned off. Setting the Phaser II dial to zero will enable a stealth version of this function where the Phaser scans for the correct code, but makes no sound and just flashes its emitter. In FX Mode, after 30 seconds of inactivity the Phaser hibernates and does not consume any power unless the trigger button is pressed. It does not have to be powered down, and so remains ready for use at a moment’s notice. If the Phaser I is docked, then pressing the trigger button fires the Phaser with the firing sound as set on the dial. If the Phaser I is not docked, then the firing sound is that of the last dial setting before the Phaser I was undocked. In FX Mode, setting nine on the dial selects the Phaser Overload sound effect. A short press of the trigger button starts the Overload sequence and a second short press stops it. In FX Mode, setting zero on the dial selects Starship sounds. Pressing and holding the trigger button and then doing a movement gesture plays one of eight authentic sounds from the USS Enterprise. The Phaser can be locked to prevent its use by unauthorised personnel. To lock the Phaser, press the mode selector button four times quickly and enter any four-digit Lock Code at the spoken prompt. 2. Press the trigger button to confirm it. 3. Repeat the process for the rest of the digits of the Lock Code to be stored. As soon the Lock Code has been entered, the Phaser will power down and lock itself. The Phaser will then need to be unlocked by entering the correct code each time it is powered up. When the Phaser I is undocked, the code may be entered by rapidly pressing the mode selector button to count out each digit of the code, pressing the trigger button after each digit to confirm. Note: If the Lock Code is forgotten, it may be overridden and erased by entering the year of Captain Kirk’s graduation from Starfleet Academy as the master unlock key: 2254. The Lock Code can be erased and locking disabled, by pressing the mode selector button quickly five times whilst the Phaser is unlocked. Before properly trained personnel will be able to use the Phaser to control equipment in their quarters, it will need to be programmed with the infrared (IR) remote control button codes of those devices requiring control. 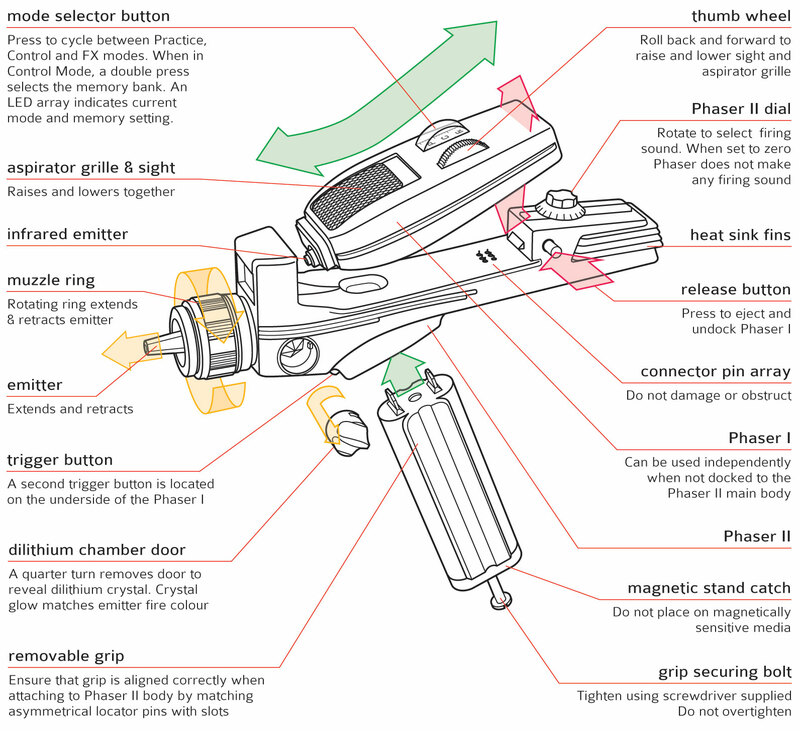 The Phaser has nine different gestures or actions. It has four separate memory banks (red, green, blue and yellow) and can store one remote control code per gesture/action in each memory bank, therefore allowing up to 36 remote control codes to be stored in total. The Phaser should only be programmed when it is undocked. To enter Programming Mode press the mode selector button with two short button presses quickly followed by a long press (holding the button down for three seconds). The Phaser will say, “entering Programming Mode”. The mode selector button will blink once per second while the Phaser is in Programming Mode. To program the Phaser, press and hold the trigger button then perform the desired gesture; the Phaser will say which gesture has been done, then the mode selector button will blink rapidly to signify that it is waiting to receive the IR code (button press) from a normal remote control. Hold a normal remote control about 1” (2.5cm) from the beam emitter of the Phaser I while it is glowing, and briefly press and release the normal remote control button for the function you want to program on to that gesture. If the Phaser received the IR code successfully, it will say “OK”. If it receives no IR signal after five seconds, it will stop waiting for the IR code, the emitter will stop glowing and another gesture will have to be performed to make the Phaser ready to receive an IR code again. Further codes may be programmed onto any other gesture or reprogrammed over the existing code on the same gesture by repeating this process, without having to exit Programming Mode each time a code has been learned. Two quick presses of the mode selector button in Programming Mode will cycle between its four memory banks (red, green, blue and yellow) allowing storage of up to four different sets of nine IR remote control codes. Programming Mode can be exited at any time with one short press of the mode selector button. It will automatically exit Programming Mode if no gestures are performed after one minute. Programmed IR codes are preserved even if the battery becomes completely discharged. However, while in Programming Mode, ten short presses of the mode selector button erases all memory banks and performs a factory reset. Caution: this operation can not be undone. Try varying the duration of the original remote control button press from very brief up to about half a second. – Try varying the distance from the tip of the Phaser 1 to the original remote control from 1 cm up to 5 cm. – Try replacing the batteries in the original remote control. This Phaser is motion activated and designed to recognise nine distinct and accurately performed gestures. It is a sensitive device and the gestures do not need to be forceful or dramatic, just positive and accurate. Always start a gesture holding the Phaser level and steady, and remember that you need to pull (and hold) the trigger button while doing the gesture. Only a short, positive action is required; the nozzle tip of the Phaser II (when the Phaser I and II are docked) or the Phaser I emitter (when the Phaser I is being used undocked) only need to move about 5 -10 cm (two to four inches). To become expert at the gestures, put the Phaser into Practice Mode and perform each of the gestures in turn. When the Phaser recognises a gesture it will say which gesture it thinks has been done. Repeat each gesture until you can do them easily and repeatably. The Phaser has nine gestures and four memory banks, and as one remote control code may be stored for each gesture, 36 remote control codes can be stored in total. The gestures are: push, pull, tilt left, tilt right, flick up, flick down, flick left, flick right, double trigger button press. To do the push forward gesture or the pull back gesture, hold the Phaser steady and level pull the trigger button and jab it quickly forward or pull it back quickly, moving it no more than about 10 cm (4″). Be careful not to rotate or accidentally flick the Phaser as you do these gestures. The gestures do not need to be big or particularly forceful, the Phaser is looking for a clear start and stop to the gesture. As you become more expert, you will find that very subtle gestures are possible. Remember that you have four memory banks, so in total you have four push and four pull gestures to record codes on to. To do the flick gestures (left, right, up and down), hold the Phaser steady and level pull the trigger and flick it sharply in the desired direction, moving the tip no more than about 10 cm (4″). Be careful not to start your flick by flicking it the opposite way first. Make sure that the flick is neat straight and clean. The gestures do not need to be big or particularly forceful, the Phaser is looking for a clear start and stop to the gesture. As you become more expert, you will find that very subtle gestures are possible and a very short discreet flick is all that is needed to get the Phaser to do what you want it to. Remember that you have four memory banks, so in total you have 16 flick gestures to record codes on to. To do the tilt gestures (left or right), hold the Phaser steady and level, pull the trigger button and tilt the Phaser over by about 90º to the left or the right. The tilt gestures are ideal for volume control. Remember that you have four memory banks, so in total you have eight rotation gestures (four each of left and right) to record codes on to. Double pressing the trigger button counts as the ninth gesture. The double button press gesture is are ideal for mute or making menu selections. Remember that you have four memory banks, so in total you have four double trigger button press gestures to record codes on to. The Phaser grip has two strong neodymium magnets in its base which locate and secure it on its die-cast, matt nickel plated stand, which also has two matching magnets hidden inside it. To position the Phaser on the stand, place it so that it is standing with the Phaser I horizontal and the grip base secured on the raised portion of the stand. To adjust the Phaser sound volume, press mode selector button six times and turn the Phaser II dial to select the volume required. When the volume is set at the correct level, press the trigger to confirm the setting. After setting the volume, remember to reset the dial to the desired firing sound effect. This Phaser is a sensitive instrument of control and should be handled with care. Clean only with a soft, slightly damp cloth; do not immerse in water; do not insert anything into the aspirator grille opening. To protect the Phaser while not on display, keep it safely in its shock-absorbent transit case. The Phaser has many exciting features and two buttons, which require a number of different button pressing sequences to access all these features. Depending on the mode the Phaser is in, certain button pressing sequences will do different things. FX Mode has been designed especially for play and cosplay. After 30 seconds of inactivity the Phaser hibernates and does not consume any power unless the trigger button is pressed, and so does not need to be powered down and remains ready for use at a moment’s notice. In all other operational modes, the Phaser must be turned on before it can be used. In the button pressing guide below Mode means mode selector button and Trigger means trigger button (that is either the Phaser II trigger or trigger button on the underside of the Phaser I when it is being used undocked). In any mode, pressing and holding the mode selector button for 3 seconds, turns the Phaser on and off. (Note that the Phaser is not automatically on after charging even though it tells you when it is charged, so please remember to turn it on after charging). In any operational mode, a short press of the mode selector button puts the Phaser into the next mode. Modes are stored in sequence so short pressing the mode selector button will take you through the modes (Practise Mode -> Control Mode -> Fx Mode) and back to the mode you started with. During Programming Mode, a short press of the mode selector button will exit Programming Mode. When in Control Mode, pressing and holding the trigger button and then doing a gesture, plays the set firing sound and fires and infra red remote control code if one has been programmed on to that gesture. When in Control Mode then pressing and holding the trigger button and then doing a gesture plays a quiet click and fires and infra red remote control code if one has been programmed on to that gesture. When in FX Mode, pressing and holding the trigger button plays the set firing sound. When in FX Mode, and the dial is set to 9, a short trigger button press starts the Phaser Overload Sequence. If the Phaser Overload Sequence is playing, a short press of the trigger button stops the sequence. When in FX Mode, pressing and holding the trigger button and then doing a one of the gestures plays one of eight authentic Enterprise Starship sound effects. When entering a Lock Code to lock or unlock the Phaser, a short press of the trigger button is needed to confirm the number of the dial setting. When setting the volume (6 mode selector button presses), a short press of the trigger button is needed to confirm the number of the dial setting for the volume. In Control Mode or Programming Mode, a double press of the mode selector button cycles round through the memory banks. In Control Mode or Programming Mode, a double press of the trigger button counts as another gesture. In Programming Mode do two short presses of the trigger button and then program a remote control code on to that gesture, then later, when in Control Mode, two short presses of the trigger button fires the programmed code and plays the set firing sound (dial setting 1 – 9) or plays a quiet click (dial setting 0). In Practice Mode or Control Mode, a triple press of the mode selector button where you hold the last press for 3 seconds makes the Phaser go into Programming Mode (note a single short press of the mode selector button exits Programming Mode). In FX Mode, a triple press of the trigger button where you hold the third press starts the Phaser scanning through all the TV OFF codes it has in its preprogrammed memory and firing them out in sequence. As long as you keep holding the trigger button down, the Phaser keeps firing TV Off codes. When the TV turns off, release the trigger button. Each time a TV code is fired out the Phaser plays the set sound (dial setting 1 – 9) or remains silent (dial setting 0), depending on the dial setting. In any operational mode, doing four quick presses on the mode selector button enables the Lock Code sequence. After pressing the button four times quickly, enter any four-digit lock code at the spoken prompt. To enter the desired four digit lock code, set the dial to the first number that you want to enter and press the trigger button to confirm the number. The Phaser will say the number that you have entered and wait for the second number in the lock code. Repeat the process for the second, third and fourth numbers of the lock code to be stored. As soon the lock code has been entered, the Phaser will power down and lock itself and make a locking sound. The Phaser will then only be able to be used when it is next powered up if the stored lock code is correctly entered. To enter the lock code, set the dial to the first number of the lock code that you previously programmed into the Phaser and press the trigger button once to confirm. The Phaser will remain silent and wait for the next number to be dialled in and confirmed. Repeat the process until you have entered the correct numbers. Once a lock code has been set, the Phaser will need to be unlocked by entering the correct code each time it is powered up. The lock code may be erased and the Lock Code function disabled by five quick presses of the mode selector button while the Phaser is unlocked. In the event that a programmed lock code is forgotten or a lock code is programmed into the Phaser by accident, it may be overridden by entering the year in which Captain Kirk graduated from Starfleet Academy, 2254. (This does not erase any of the learned IR codes). While in any operational mode, and the Phaser is unlocked, pressing the mode selector button five times quickly erases the stored lock code. Doing this does not erase any of the stored remote control codes. When in Practise Mode or Control Mode, 6 short presses of the mode selector button allows you to adjust the Phaser’s volume using the dial. To adjust the volume, press the mode selector button six times quickly. The Phaser will beep once and announce the current volume setting. Adjust the dial to the desired volume setting and then press the trigger button to confirm the new setting. When you press the trigger button, the Phaser will confirm that the volume has been set and return the Phaser to the mode it was in before you set the volume. After setting the volume, remember to reset the dial to the desired firing sound effect. While in Programming Mode, 10 short presses of the mode selector button performs a factory reset and erases all the stored codes on the Phaser. Please note that this action can not be undone.